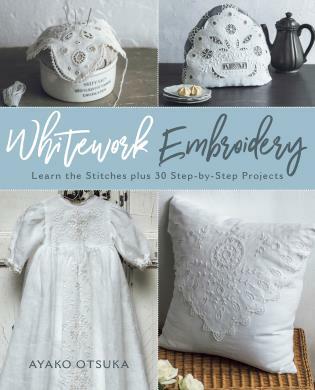 All you need to know to make exquisite whitework designs! Whether you are new to whitework or just need a refresher, Whitework Embroidery will show you how to make a variety of stitches including drawn work, pulled thread work, Hedebo, count work, and Schwalm. Step-by-step instructions make the stitches easy to learn, and two sampler patterns give you the perfect canvas on which to practice the stitches and make a decorative wall hanging at the same time. Full photo-illustrated instructions and all necessary patterns for each of 30 projects are included. Choose from a variety of elegant designs for the home including table linens, pillows, and items for tea time, and designs for baby including an heirloom christening gown, bonnet, bib, and booties. Delicate pouches and a ring bearer pillow will add a personal touch to a special wedding. Each of the handwork pieces you make is sure to become a cherished keepsake. Embroidery designer Ayako Otsuka is the director of Embroidery Studio Ecru and a member of the Japan Association of Linen Spinners. She has been immersed in the world of embroidery since childhood, learning from her mother, a designer of Japanese and Western style embroidery. Ayako is the author of several books about embroidery published in her home country of Japan. She specializes in teaching whitework, stumpwork and botanical embroidery and exhibits her work in Japan and abroad. Her official website is http://www.studio-ecru.com.